The Acting Company, a touring company out of NYC that travels around the country presenting classical works of theater, has spent the month of January at the Guthrie Theater. I saw them a few weeks ago doing Shakespeare's slapstick comedy The Comedy of Errors. I enjoyed the talented young cast so much that I had to go back to see the other show they were doing in repertory - Romeo and Juliet. It was fun to see familiar faces in totally new roles, and although this play had a completely different tone, they again did a wonderful job and worked well together. Our Romeo (Alejandro Rodriguez) and Juliet (Kaliswa Brewster) had pretty minor roles in The Comedy of Errors so I wasn't sure what to expect from them. I was impressed by both of them. They look the part of the young lovers and were believable falling in love, which quickly turned to despair. Alejandro went from the carefree and blissful youth to the man in anguish at losing his love, literally writhing on the ground and sobbing. The plum part of Juliet's nurse was played by Elizabeth Stahlman with great humor and energy. Sid Solomon played Romeo's kinsman Mercutio with much of the same mannerisms as he had in Comedy, which I probably would have enjoyed more had I not been reminded of his previous character. But he also played the Prince, a role in which he was almost recognizable. Elizabeth Grullon played the boy Peter, a fun change from her vampy role in Comedy. The delightful Comedy clowns Stephen Pilkington and John Skelley played the smaller but still entertaining roles of Romeo's pals. 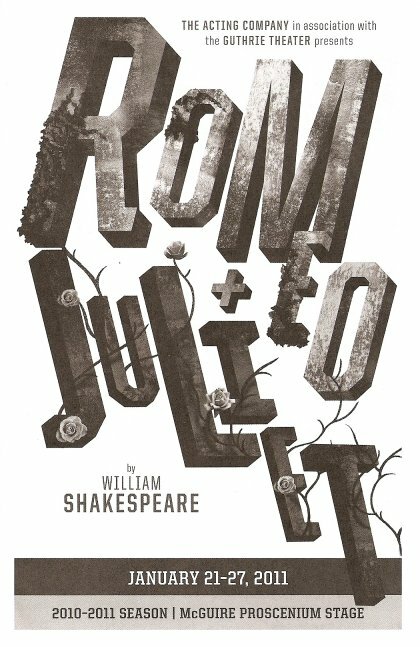 Whenever I see Romeo and Juliet I get frustrated by all the near misses and how differently things could have turned out. Like maybe this time, the Friar's message will get through to Romeo so he'll know Juliet is not really dead. Or Juliet will wake up just a few minutes sooner, before Romeo has a chance to drink the poison. Or better yet, the Friar will suggest that Juliet sneak out of her house and run away with Romeo instead of the preposterous plot of faking her death. But it never happens; everything goes wrong and the love story ends in tragedy. That's what makes it so deliciously heartbreaking. After this week the company moves on around the country with their two plays, until they end the season in NYC in April. Check out their tour itinerary to see if they'll be at a location near you.